This post is sponsored by Bob’s Red Mill. They make a huge range of quality products including the fantastic Chai Chia Protein Powder I used for this smoothie. Check them out on Facebook and follow them on Instagram for lots of fun recipe ideas. 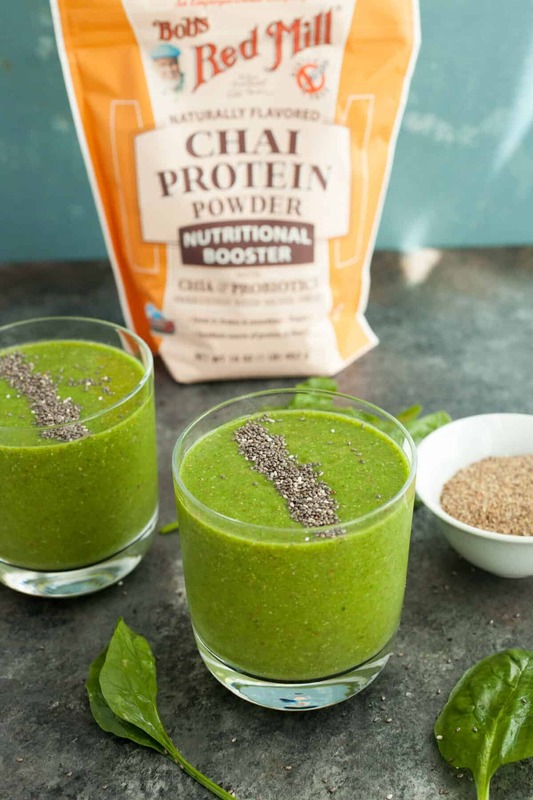 I have to admit that when I first tried the Chai Chia Powder I used for this green smoothie, I thought there was a big huge typo on the bag. I thought it was supposed to read CHIA protein powder. But then I tried it in a simple smoothie and was immediately corrected because it was, in fact, CHAI as well as Chia. Go figure. Bob’s Red Mill was right and I was wrong. You might think that chai is too much flavor for a smoothie, but I promise it is not. This is on the subtle end of chai spices once you blend it with other stuff, but it gives the smoothie an addictive, slightly sweet and spicy flavor. I can’t get enough of this stuff. When I started experimenting with it I had a smoothie every day for lunch for a week straight and never got sick of it. My favorite version though was this bright green smoothie with loads of fruit and protein. My favorite thing about this smoothie is that it’ll keep you full for hours. It’s not one of those weak little smoothies that leave you hungry again in 30 minutes. You drink it and you are good to go! 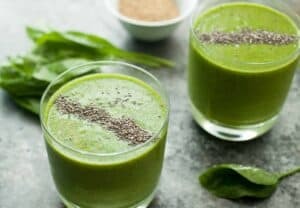 Kind of a tongue twister but these green smoothies are a great way to start the day or they are filling enough for a light lunch! Wash the spinach well and add two very packed cups of it to a blender along with banana, frozen fruit, flax, chia, OJ, ice, water, and Chai Chia Protein powder. Blend until smooth. If it seems too thick while blending, add more water by the 1/4 cup to loosen it. This smoothie uses this delicious stuff right here. You can occasionally find it in stores, but you can also always order it on the Bob’s Red Mill website. 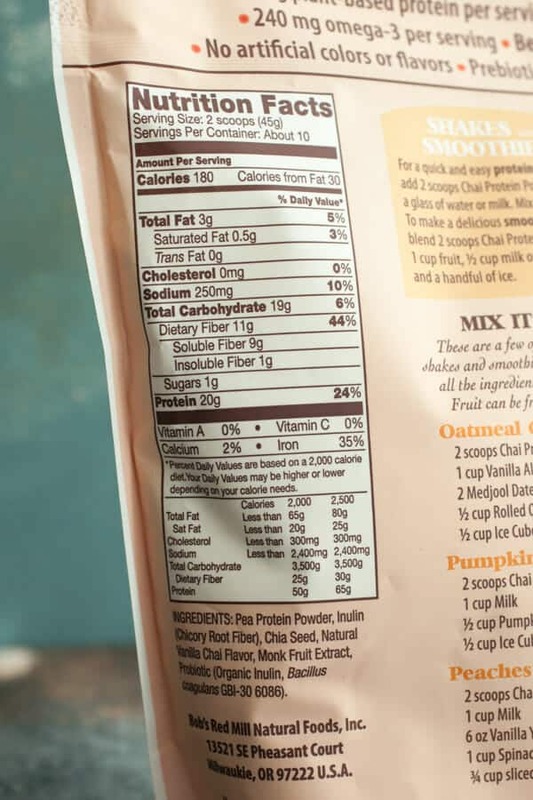 One look at the nutrition facts and you should be able to spot why this stuff is amazing in a smoothie. One serving of this stuff has a whopping 20 grams of protein, and possibly more importantly, 11g of fiber! I tried to keep the other stuff pretty standard, but I’d also encourage you to experiment with other flavors. 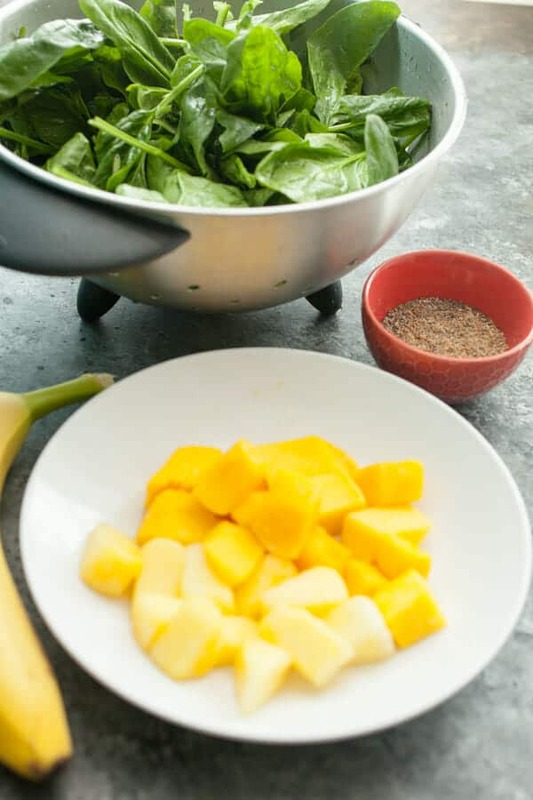 If I’m making a green smoothie though, I like to use yellow fruit like mango and pineapple which will keep the green color really bright in the final smoothie. 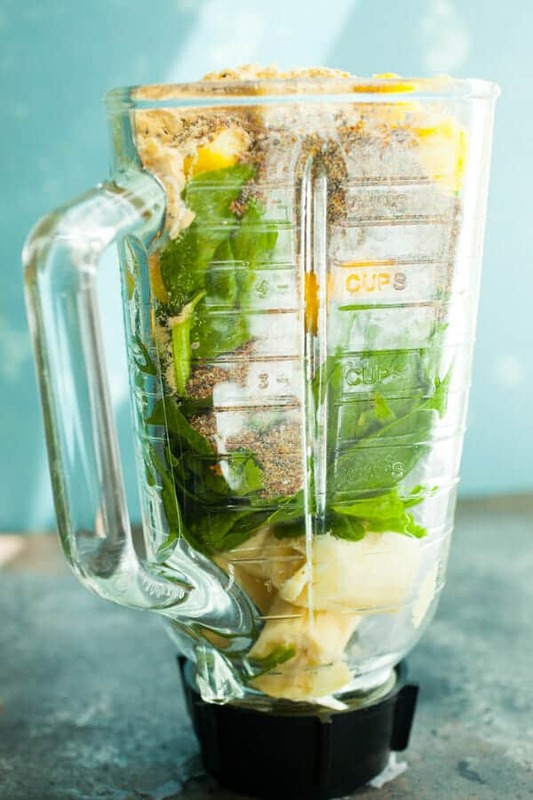 Add everything to a blender and blend it up! I like to add the banana first so the blender can get going with something softer. Also, you might want to vary the water and orange juice in the recipe to fit your personal preference. The finished smoothie has a nice light fruity flavor with subtle chai notes to it. Honestly, I can drink a whole blender full of this recipe with no help from others! As a bonus, my two year old absolutely LOVED this smoothie and I felt really good about starting his day with it. Since it’s getting to be in the middle of the hot months, a chilled out green smoothie is about as good as it gets in my opinion. Has anyone else tried this protein powder? It’s my new favorite thing. 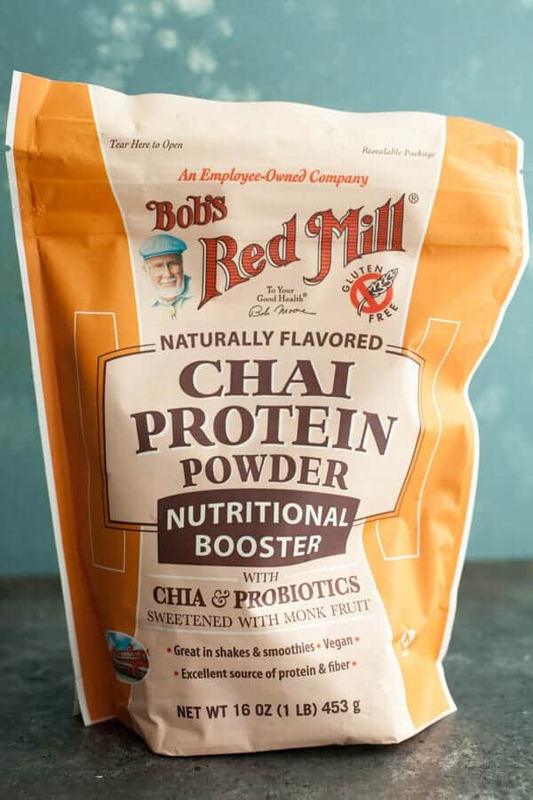 Wow, that chai protein powder is pricey! But with 20g of protein per 2 scoops, it might actually be cheaper than the protein powder I’m using in shakes. Have to check it out, but I’m not sure if it’s here in Canada. It sure sounds healthy though, and probably just as delicious.